Small Modern Bench free plan. This modern wooden bench is small in size, has clean lines, and would be perfect in an entryway or hallway. Build it with the free plans at the link. Storage Bench free building plan. This modern storage bench looks great in an entryway and has the bonus of extra storage. The top is hinged and flips up. Build it using these free plans. Oh, and it is built using plywood. Double bonus. Large Modern Bench free building plan. This beautiful modern bench measured 60 inches long when complete. At the link you can download the free plans and follow along with the step-by-step plans. Small Modern Bench free building plan. Build a small modern bench using the free downloadable woodworking plans available at the link. Perfect for your entryway or mudroom. Pictured are two benches placed together to make one long bench. Of course you can build as many as you like using the free plans available at the link. Modern Outdoor Bench free building plans. Build a modern bench perfect for by your front door. this one is even pretty enough to bring indoors. Free plans provided at the link. Build a 6 foot farmhouse bench using these free plans. The length can be made shorter to suit your space with just a few adjustments. These wall mounted benches are perfect for a mudroom or locker room. You could even take these instructions and use them an outdoor patio using exterior grade lumber. 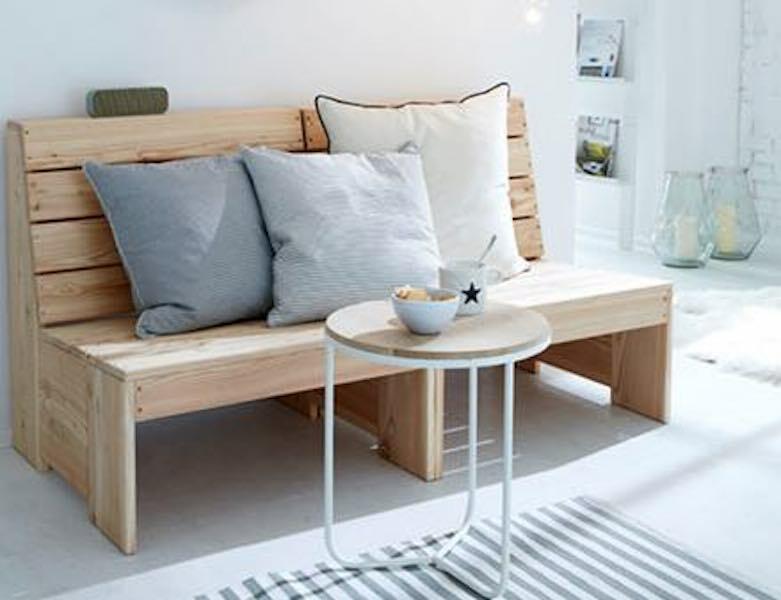 Using the free plans at the link, you can build this 6 foot long farmhouse bench. Good for indoors our outdoors depending on the wood you choose. Storage Bench free woodworking plans. Here is a free plan to build a modern storage bench. Build this beautiful storage bench using the free downloadable woodworking plans at the link.